If you are looking for information on the Cruise Holidays franchise business opportunity, Cruise Holiday franchises or Cruise Holidays franchising, then you have come to the right place. Since 1984 Cruise Holidays® has been the leading cruise travel expert for customers in the US and Canada. As part of The Travel Franchise Group, with over 7 Billion Dollars in annual travel revenues, we are now seeking motivated individuals to own this prestigious business in your market. 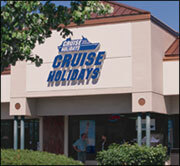 Since 1984 Cruise Holidays® has been the leading cruise travel expert for customers in the US and Canada. Leverage your passion for travel and help people plan their dream vacations every day.